It's time for another Wedding Workspaces, and this month, we're sharing our fifth installment with another fab local wedding pro! 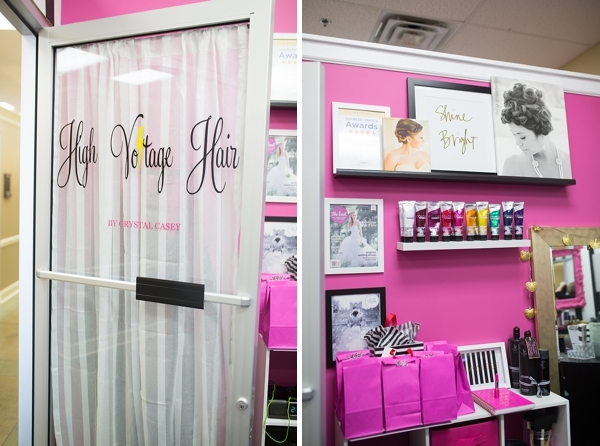 And today, we have wedding hair stylist expert and vendor fam Crystal Casey of High Voltage Hair and her bold and fun hot pink hair salon in Virginia Beach. 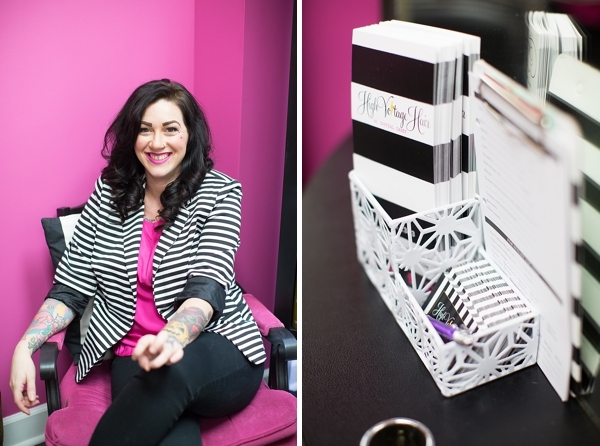 Through black and white stripes and a whole lot of pink, this spunky and talented hair artist showcases her personal style and mission to help make her clients own their individuality through gorgeous hair. My inspiration actually came from my business cards and service menu. I remember when I was still fairly new to the wedding game, and I had just met Tara of Tara Liebeck Photography, and she asked me for some more of my business cards. So, I handed them to her, and she asked if they were new cards to which I replied, "Yes." What she followed with was some of the best business advice anyone has ever given me. She told me I needed a brand, and that she should be able to see my business card sitting on a table across the room and know that it is my business card. Well, considering my workspace is a mere 115 square feet, I'd have to say the whole thing. haha! But really on most days, it's the coffee cart and my cute pink mini Keurig! Everything in my studio can be found in Hampton Roads or Ikea (let's be serious that place is the best! ), but most of it is from my old apartment or stuff I had from my previous hair workspace. I just revamped it for this new space. I pretty much had my entire design laid out in my head before I ever moved in. I knew excatly where I wanted everything placed, what color each item would be... and it worked out almost perfectly! My neighbor and my dad helped A LOT. My neighbor put my floors down for me and hung most of my big stuff. It was actually him and my dad who suggested the LED lights for my retail shelf (which I have to say makes a HUGE difference). 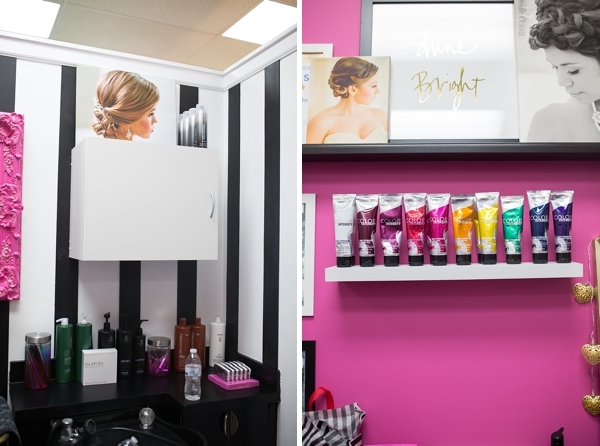 I revamped a lot of items I already owned to make them fit the salon, and I did an entire blog series on my DIY Salon furniture. I just knew I wanted my space to really reflect me and my personality. I wanted it to be a place I would enjoy stepping into everyday as well as my clients. 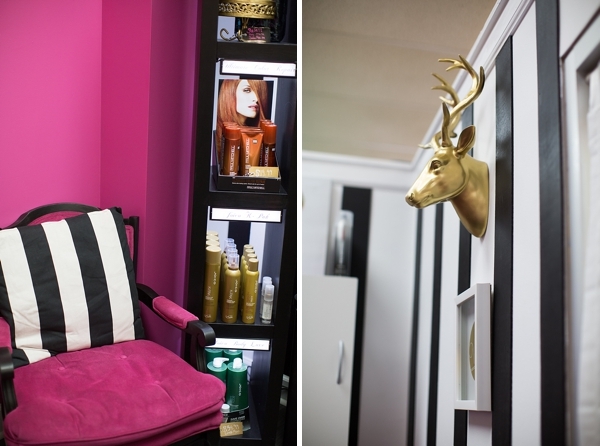 While a lot of salons are designed in the posh and luxury decor style, I knew it just wasn't me. I love to have fun with my clients. It's a fun, modern space where everyone can be themselves! Are you a DIY person or did you hire someone for interior design help? I am a total DIY Junkie. I pinned a lot of things on Pinterest-- none of which had the same look or feel. But I did find this ONE image of a reception desk with a black and white striped wall behind it, and that's when I knew I would have a black and white striped wall. My entire black and white wall is DIY along with my lighted retail shelf and my coffee station mirror. You can get to know Crystal and her hair-mazing happenings on Facebook and beauty project captures on Instagram.